It wasn't an easy choice, but the judges gave the Men's Physique Showdown trophy to Mark Anthony Wingson. Learn how he stood apart from this talented field of aesthetic bodies. Among the vendor booths and powerlifting competitions of the expo, a historic event happened on the Olympia stage. This afternoon, the men&apos;s physique category was contested to decide who would become the first ever Physique Showdown winner. The tanning spray was on, board-shorts tied, and the stage set for this ultra-popular event. Like the women&apos;s physique division, men&apos;s physique is meant to award those physiques that are shapely and defined without being too massive or dry. 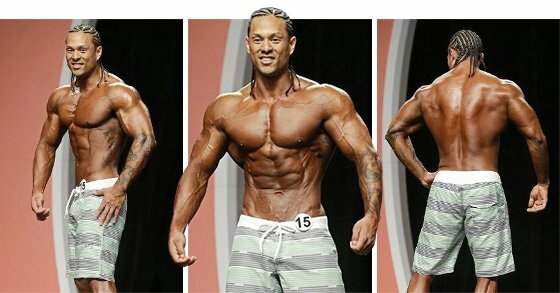 Among a group of five awesome physiques, Mark Anthony Wingson brought the shape the judges most wanted to see. He was well-proportioned, well-muscled, not overly conditioned, and his personality showed through to the excited crowd. He brought all the tools necessary to present a winning physique! The first callout brought Matt Acton, Tyler Anderson, Jeremy Buendia, Sadik Hadzovic, Jason Poston, and Mark Anthony. The judges took a long time deliberating, but I certainly didn&apos;t mind the view. Each guy was moved around for physique-to-physique comparisons. Sadik looked fantastic; his waist was tiny and his shoulders broad. Jeremy Buendia&apos;s physique, though, looked about as perfect as it gets, and he definitely gave the winner a run for his money. These guys knew the expectations, and they didn&apos;t take them lightly. Michael Anderson, Alex Carneiro, crowd favorite Steve Cook, Jeff Seid, and Anton Antipov came forward for the second callout. Going in, Cook was picked by many as the favorite to win, but perhaps looking a little too hard and muscular, he found himself in the eight spot. After some posing, the judges sent Steve and Michael back in line and brought out Tory Woodward, William Sullivan, and Stephen Mass for posing. It was a long confirmation round, but the judges weren&apos;t done yet. They called back Tyler, Jeremy, Sadik, and Mark for one more round of posing. Mark and Jeremy were alone in the top spots, as they should have been, before they were all sent backstage. After such a long judging period, the stakes always seem a little higher. For their final decision, the judges called out Jason Poston in fifth, Sadik in fourth, Matt Acton in third, Jeremy in second and gave Mark the win. As in the women&apos;s showdown, the judges chose their champion well. Each guy demonstrated thee aesthetic, classic lines everybody loves, and yet the top two stood out clearly as the best on this particular day. The future will be particularly interesting in this division, as the number of competitors is large and seems to be growing larger. Winning the Men&apos;s Physique Showdown is only going to get harder.